A visitor to London, walking south across London Bridge, will notice several landmarks competing for his or her attention. The highest construction in sight (unsurprisingly, since it is currently the tallest building in Europe) is Renzo Piano's recently completed "Shard," but, as its architect explained to a group of us at the London Architecture Biennale a few years ago, its glass walls were always intended to reflect images of one of the oldest buildings on the south side of the Thames, now known to Londoners as Southwark Cathedral (although it only became a cathedral in 1905). 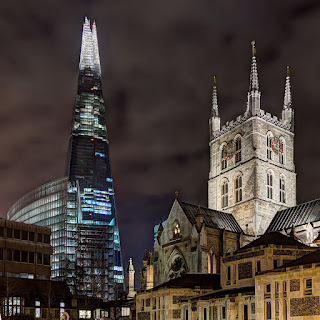 The Shard and Southwark Cathedral. Photo: Dmitry Tonkonog (licensed under CCA). 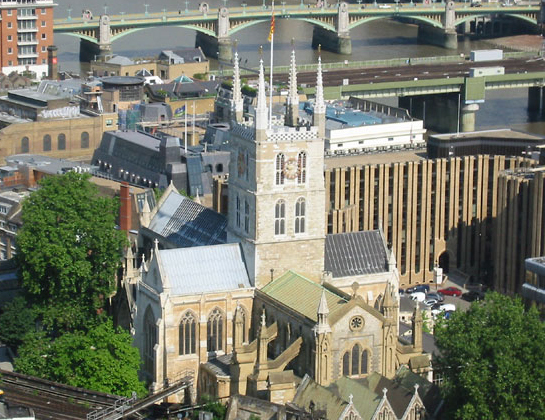 Southwark itself has a claim to be London's oldest suburb, having been established by the Romans in the First Century AD. It may even have served, briefly, as the capital of Britannia, following Boudicca's destruction of Colchester and London in 60/61 AD. "Suthriganaweorc" (the fort of the men of Surrey) was subsequently fortified by King Alfred the Great against the Danes, and, in 1066, was defended against the forces of William the Conqueror, forcing him to take a longer route to the west, encircling London from the north. 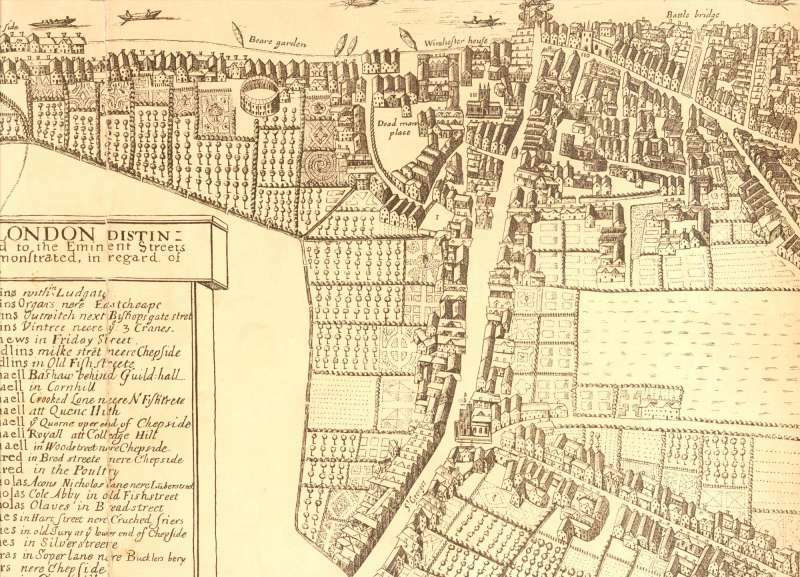 The Borough and Bankside, 1658 (image is in the Public Domain). The curve to the west of the priory may reflect the line of the Anglo-Saxon defences. 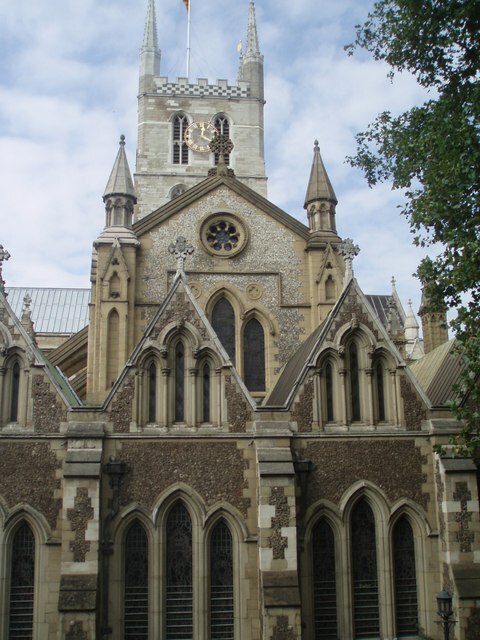 The building we currently know as "Southwark Cathedral" stands on the site of a "minster," recorded in the Domesday Book of 1086 as being held by the conqueror's half-brother, Odo of Bayeux, and subsequently re-founded in 1106 as the Augustinian Priory of Saint Mary Overie. The footprint of the current building probably reflects that of the priory church of 1106, although it was substantially rebuilt following fire damage in 1212 and 1420. 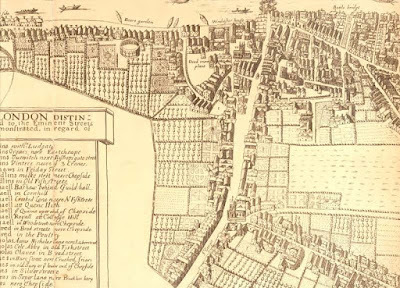 The Elizabethan chronicler, John Stow, interviewed Bartholomew Linsted, the last Augustinian prior, who told him of a tradition that a nunnery had existed on the site since the Seventh Century, although there is no archaeological or documentary evidence to support this. 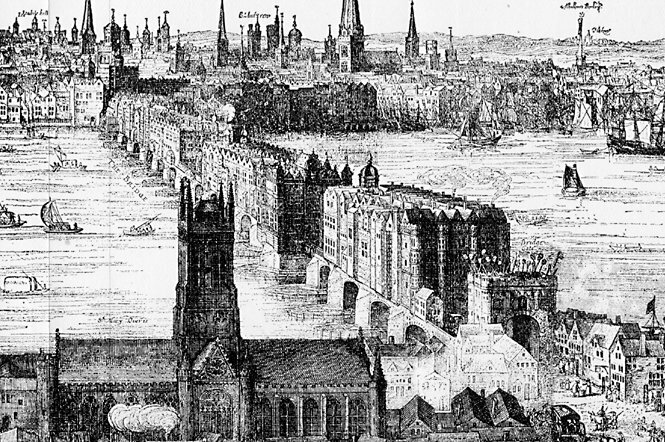 Southwark Priory and London Bridge, by Claes Van Visscher (1616 - image is in the Public Domain). Southwark Cathedral from The Shard. Photo: Kevin Danks (licensed under CCA). 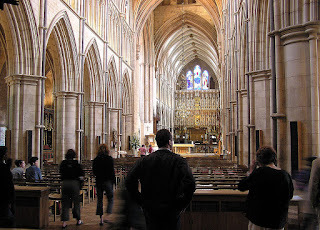 The nave of Southwark Cathedral. Photo: Adrian Pingstone (Arpingstone), licensed under CCA. 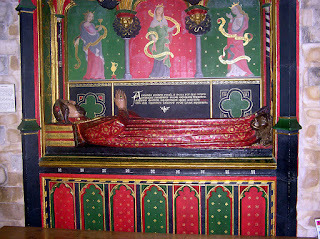 Wooden effigy of a knight (possibly a member of the de Warenne family, 1280-1300), Southwark Cathedral. Photo: Amandajm (licensed under CCA). The Fourteenth Century poet, John Gower, a contemporary and friend of Geoffrey Chaucer, had a house within the precincts of the priory, and is buried within. 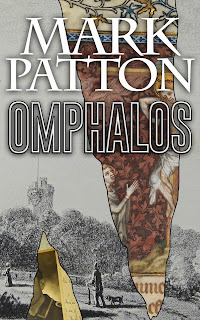 He served as poet laureate under both Richard II and Henry IV, and was remunerated, like the current incumbent, in wine. 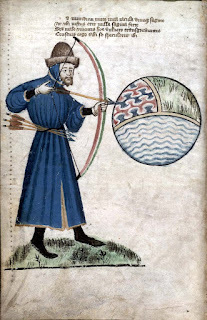 John Gower, shown loosing an arrow into the world (a sphere consisting of land, air and water). 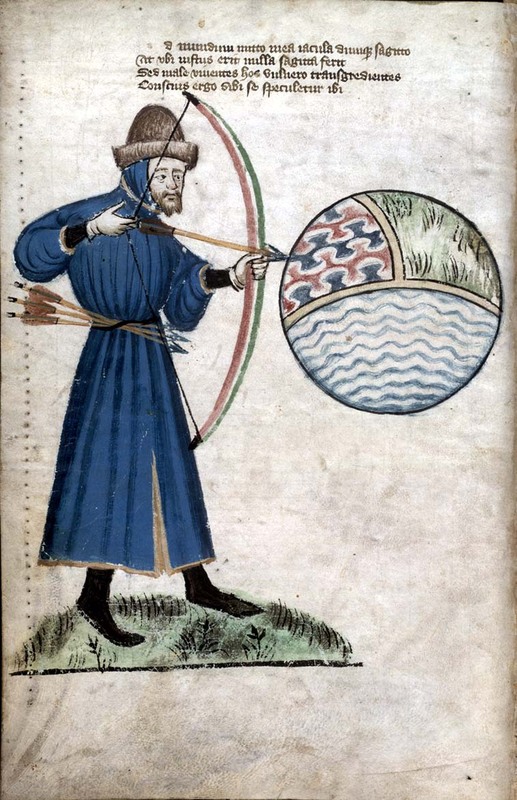 University of Glasgow, MS Hunter 59 (T.2 17,folio 6v - image is in the Public Domain). 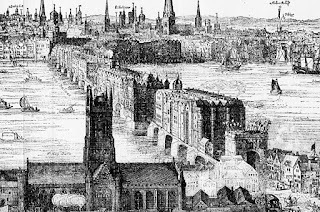 Wenceslas Hollar's "Long View of London," from a sketch drawn from the tower (image is in the Public Domain). Gower's house is likely to have been close to the river. 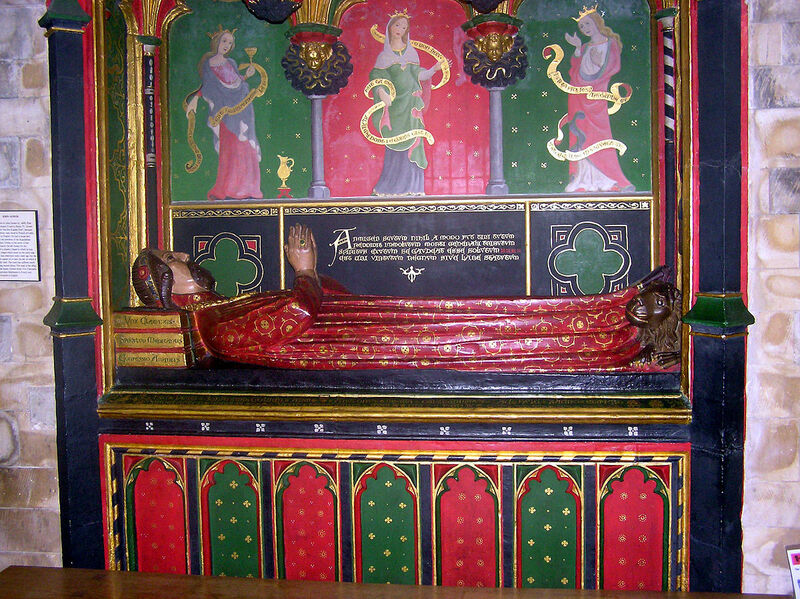 The tomb of John Gower in Southwark Cathedral - the preservation of colour is rare in the context of English churches. Photo: Adrian Pingstone (Arpingstone) - image is in the Public Domain. 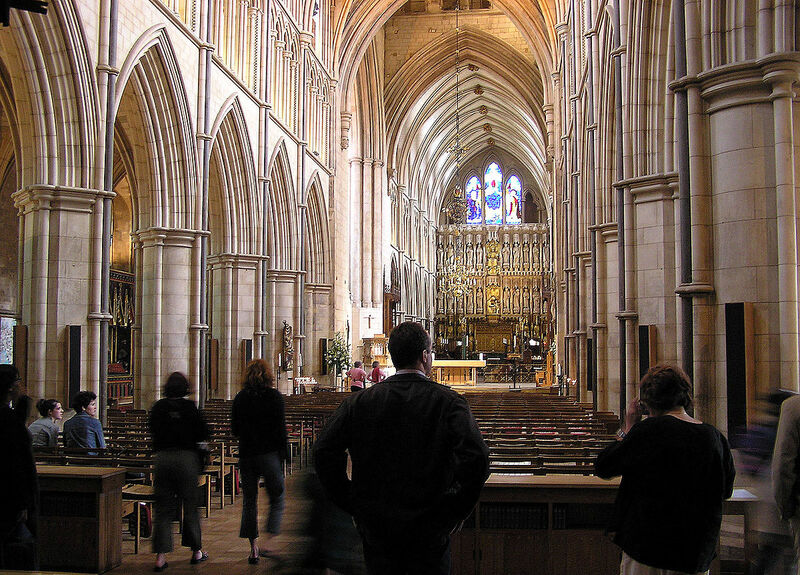 With the dissolution of the monasteries under Henry VIII, the priory church became the Parish Church of Saint Saviour (within the Diocese of Winchester), serving the growing population of Southwark, a district of theatres, bear-pits, and brothels. Those buried here included Edmund Shakespeare, William's younger brother, an actor who died of the plague; the Jacobean dramatists John Fletcher and Philip Massinger; and a chief of the American Mohegan tribe, Mahomet Weyonoman, who traveled to London in 1735, to petition George II for the rights of his people, but who succumbed to smallpox. By the early Nineteenth Century, the church had fallen into disrepair. Restoration works were carried out by George Gwilt Jun (1818-30) and Sir Arthur Blomfield (1889-97), but were strongly criticised at the time for failing to respect the Medieval fabric of the building. Southwark Cathedral, showing Nineteenth Century restorations. Photo: Paul Gillett (licensed under CCA). 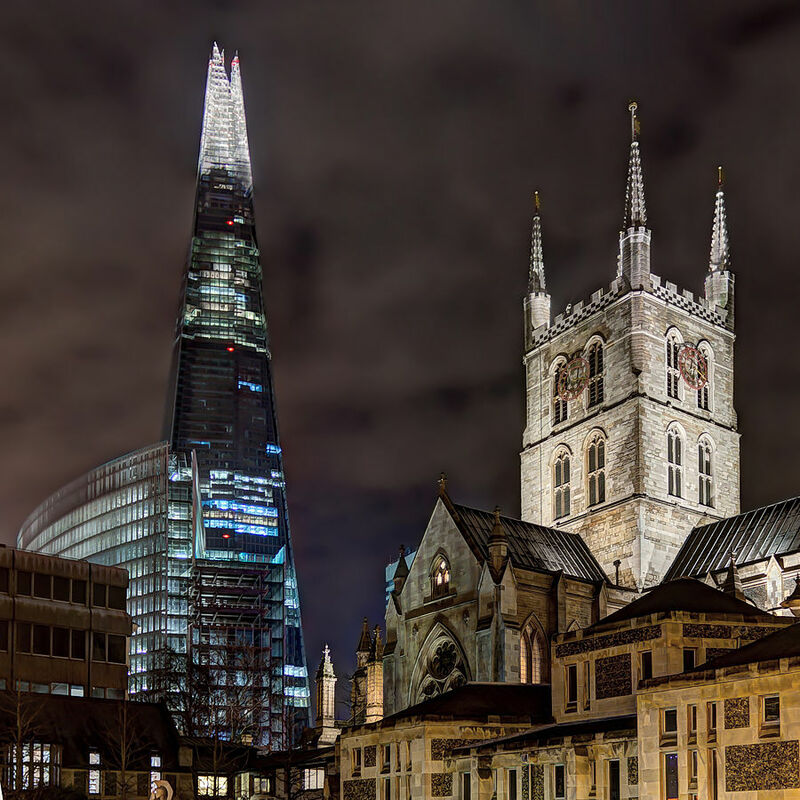 The "cathedral," as it stands today, may be something of a hybrid, but its tower, at least, is a landmark that Chaucer, Gower, and Shakespeare would recognise, one of the few fixed points in the shifting landscape of London's oldest suburb. 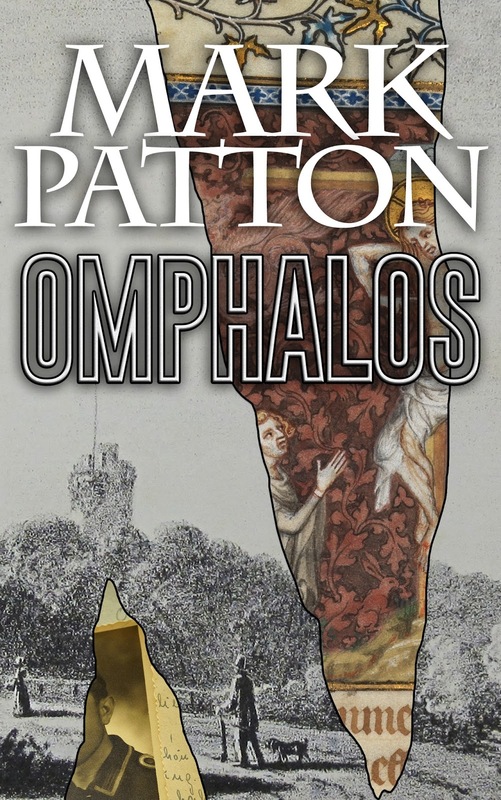 Mark Patton is a published author of historical fiction and non-fiction, whose books may be purchased from Amazon.